What do you think happened when foreign investment fled from Argentina after the country’s IMF-poster-child economy collapsed in 2001, shutting down many of the country’s factories overnight? 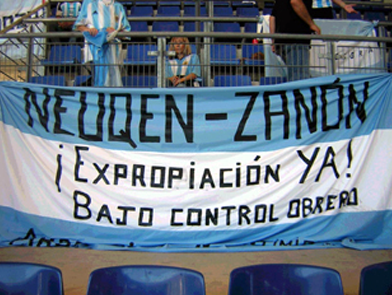 For one, the Argentines ousted five presidents in the first months of 2002 to voice their displeasure. But rather than simply protest, a movement of suddenly unemployed workers emerged to reclaim abandoned workplaces and run them as democratic workers’ collectives. Recovered businesses, as they were innocuously termed, spread across Argentina as workers returned to their old factories, clipping the chains on the gates that stood between them and their jobs. Their slogan, ‘Occupy, Resist, Produce,’ highlighted the radical nature of the movement, which threw private property rights into question, as more and more workers began to assert that their right to work trumped the employer’s right to own an empty factory. Occupied factories took on different forms. Some remained relatively traditional, with clear job titles and hierarchical salary structures, while many others began to change the nature of their workplaces in a range of deeper ways. Assembly decision-making processes, equal salaries across the workforce, and collective administration of the business, in sales, pay role, budgeting, and production forecasts, were but a few of the shifts that began to take hold in many of the factories. For example, when the recently jobless Unión y Fuerza piping factory workers voted to occupy their old workplace, their union’s lawyer told electrician Roberto Salcedo there was no way they could get the bankrupt factory up-and-running again. ‘If the owner, with his entire team of professionals and all his experience, ended up bankrupt, how could fifty workers with no experience manage to make it work?’ii But the men – not a university degree among them – formed an assembly where all decisions were made, registered as a workers’ cooperative, turned down loans from eager banks and investment from former clients, and did just what they were told they couldn’t. In a diving Argentine economy, these workers carried out a market evaluation, determined potential income and expenditure (minus the costs of all the long-gone managers), and decided together to opt for an equal waging system for all. Unión y Fuerza soon became the biggest domestic pipe supplier in Argentina. If our social change organisations are committed to practicing the democratic values we speak about, it is hard to imagine why senior management teams still exist at all. The notion that staff in any organisation are unable to come together to make responsible decisions is an elitist remnant of Frederick Winslow Taylor’s time that needs to be thrown away if we hope to align our means and ends for social change. But if the notion of scrapping Senior Management still seems excessive, why don’t we think for a minute about some other important events in our shared histories that have transpired without a single manager orchestrating peoples’ actions. While countless Argentine companies went bankrupt in Argentina, but became financially sound without managers, if we had tried to achieve the changes brought by social movements through our organisational management structures, we can almost guarantee we would – at best – have gotten in the way. All of which should lead us to ask whether, even with the best of intentions, management itself might be the problem? This is an extract from Liam's book “Anarchists in the board room”, which you can buy here. i Naomi Klein & Avi Lewis, The Take, Hello Cool World, 2004.
ii Lavaca collective, Sin Patrón, Haymarket Books, 2007, p. 188.